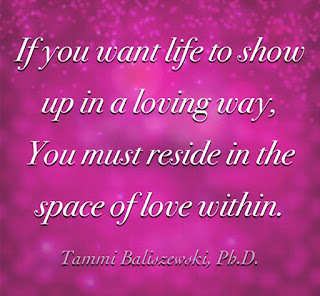 Courage, Confidence & Great Love – Tammi B. Ph.D. In order for life to show up in a supportive, kind and loving way, we must come into a supportive, kind and loving relationship with ourselves. And since most of us have experienced a fair amount of drama, trauma and disillusionment in our lives, this can take some conscious intention and a bit of inner work. The process of relinquishing fear, awakening and stepping into our authentic power rarely happens all at once or quickly. Nor should it. Waking up to the love we are, and the work of enlightenment, is best approached as a marathon rather than a sprint. Slow and steady is the best approach. For me healing and relaxing into love has been about learning to trust myself and having faith in the process of life. It can be helpful while in the throes of fear to ask yourself “What is it I am really afraid of?” Then compassionately listen to whatever comes up. Usually it is a younger part of ourselves that has experienced some trauma and has some unprocessed pain. Imagine soothing your younger self with presence, patience and empathy. Consider allowing this young one to express their feelings by writing down what comes up in a notebook or journal, and then responding as your adult-self in a kind and gentle way. Another helpful practice can be to invite your Higher Power as you know it to be part of the conversation. Ask questions, share your feelings, opening to accessing your own personal aha’s, insights and inner wisdom. This is a powerful practice that can help us unravel fear, cultivate courage and begin to heal from the inside out. I have found as I take care of my relationship with inner child and my relationship with God/Spirit/The Universe, my life works with much more peace, grace and joy. This can start to clear the path for you to expand energetically and relax in to the being you were always destined to be. And as a wonderful bonus, joy, peace, creativity, celebration become your natural state of being. Being centered in your loving despite fear (an acronym for False Evidence Appearing Real) can be like building a muscle. As we do this kind of inner work, we are often (and maybe always) met with grace and God winks, This can help us know that we are being supported by Something Greater. This is how we deepen our roots in physical world reality and become stronger, more solid, and more evolved souls. And once become aligned and congruent body, mind and spirit, we are more comfortable in our skin, more naturally confident and a more peaceful presence in the world. Consider this image and analogy: If the roots of a tree go deep, the natural side effect is for the branches to go high. The more deeply anchored you are in your self love, the more at home you feel within yourself, in the world and the more natural success, joy and wonderful relationships will be. When you are grounded centered and aligned in your loving and beingness, the doingness and success happens as a natural side effect and consequence. Manifesting and naturally attracting what is yours by Divine Right occurs with a lot more grace, ease and synchronicity. The truth is as you take responsibility and cultivate a relationship a peaceful relationship with your inner reality, your outer reality will take care of itself. And once we relinquish fear, and relax in the place of love within, love is all around us. Love from others and life is simply a reflection of who we are, and a mirror of our divine nature. And please be in touch with any thoughts, questions, ideas, stories or revelations of your own. It is built on WordPress. Hope that helps!